People left work and school early to join the demonstration. They included members of the Ukrainian and Russian immigrant communities, Harlem residents, and members of anti-fascist and anti-war organizations. 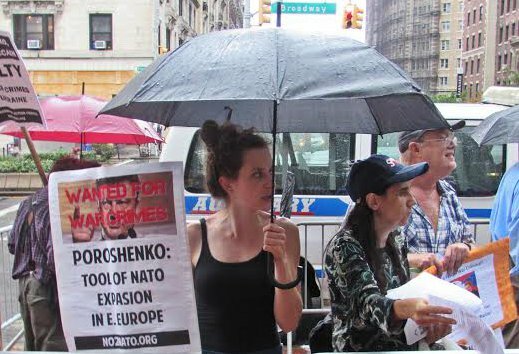 Holding signs with Poroshenko’s photo and the words “Wanted for War Crimes,” the protesters informed Columbia students, workers and residents of the West Harlem neighborhood about why the Ukrainian oligarch should be standing in front of a war crimes tribunal, instead of being given the red carpet treatment by a university. Signs and leaflets laid out the charges against Poroshenko: his responsibility for more than 7,000 deaths in the war against the independent Donetsk and Lugansk People’s Republics; forcing 1.3 million people to become refugees; jailing journalists and political opponents; banning communist ideology while celebrating fascist collaborators; violations of the Minsk 2 ceasefire agreement, including shelling and terror attacks aimed at hospitals, schools and other civilian targets; and acting as the agent of Wall Street and Washington to impose austerity and NATO expansion. Protesters also carried flags of the Donetsk People’s Republic, the Ghost Brigade of the Novorossiyan people’s militia, the Ukrainian communist organization Borotba and the Soviet flag of victory, symbolizing the triumph over fascism in World War II. Carrying any of those flags in Poroshenko’s Ukraine would result in arrest — or worse. Longtime Harlem activist Nellie Bailey drew the connection between Columbia University’s gentrification policies, aimed at driving African-American residents out of the neighborhood, and its promotion of far right-wing and neoliberal regimes like Poroshenko’s. Protesters successfully faced down several provocations by Ukrainian fascists. A Poroshenko supporter attempted to tear down the flag of the Donetsk People’s Republic. When this failed, a member of Poroshenko’s security detail physically assaulted a protester who was handing out leaflets. A second protester intervened to stop the assault, since police refused to. The police shielded the violent fascist, but gave a summons for “disorderly conduct” to the activist who stopped the attack! The provocateur who tried to tear down the flag was later identified as Peter Zalmayev, executive director of an organization called the “Eurasia Democracy Initiative” and director of the Eurasia Institute at Columbia University. Zalmayev kept coming back after the assault, shouting that the anti-Poroshenko protesters were “paid agents.” But it seems he, in fact, is a very well paid functionary of the junta and U.S. imperialism. Zalmayev’s Facebook page shows him meeting with New York Mayor Bill de Blasio and frequently appearing on pro-Poroshenko media.